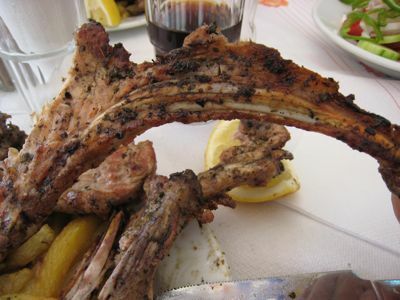 One of the reasons we headed to Evripidou Street, besides the spices and the shop Elixir, was a highly recommended taverna named Telis, whose specialty for the last 30 years has been grilled pork chops. 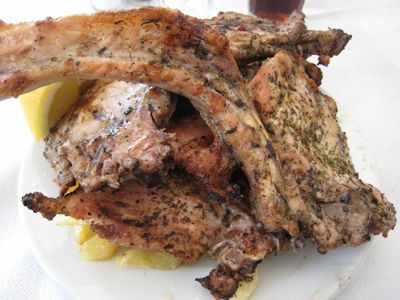 But not any pork chops, rather, superbly seasoned and very thinly sliced grilled pork chops. FoodJunkie (Jo) who is based in Greece, had also highly recommended this modest taverna in her list of places to eat in Athens, so we made sure to set aside one lunch to try it out. It did not disappoint. 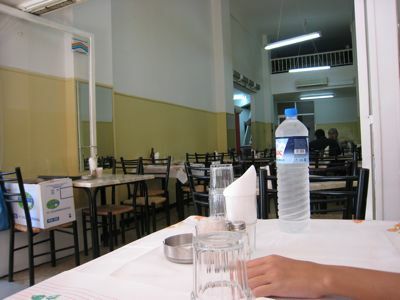 We got to the taverna a little earlier than we expected, so we were one of the first to sit down to lunch…. The place was a bit of a hole in the wall, but well lit and extremely clean. We got a very short menu, but decided to just go for the house specialty and ordered some pork chops and a greek salad without thinking twice. When the waitperson asked how many pork chop orders, we instantly said “three,” and he walked away with this look like, “whatever you say.” Not to mention he was probably thinking “odd Japanese family with a pork fetish.” A few minutes later, he turned the corner bearing three of the most massively piled high plates of pork chops you have ever seen. Each plate had at least four huge, albeit thin pork chops on a mound of french fries! Between the three of us, we stared at the chops in disbelief, and simultaneously burst out laughing. They were very reasonably priced, so we chalked this up to experience. looks yummy! how did it taste? what spice do the greeks commonly use? It looks good though, the porkchops, albeit being very thin. Thanks for the tip in buying green peppers for salads. If you want to try making these any butcher in Chinatown anywhere will have these thinly sliced porkchops. Also used for “Peking porkchops”. MM you have made me a celebrity! the poor pig had to diet. I love that gigantic slab of feta cheese on the salad!!!!!!!!! what about those chinese waiters in HK, they really take advantage of us not speaking their dialect and doubles or triples our orders for foods. I’m enjoying your Athen’s posts and mentally putting together a meal of some of the nicest treats you’ve showcased. Mmm. i love pork chops as well especially with a little fat. sometimes i order from my butcher and request pork chops with still the skin on it. i marinate the pork chops overnight with soy sauce, garlic and a lot of calamansi juice. the next day, i slowly cook them with the marinade until they get tender and has absorbed all the marinade. after that, i dipped them with the scrambled egg, flour and the bread crumbs. i deep fry the coated pork chops until they become crunchy on the outside and tender inside. these pork chops go well with the achara on the side…. Openonymous, be cautious when you you use the word promdis.Since people from the provinces who attend school and go to Manila for shopping is not what you think. They can be sophisticated,knowlegeable and world travelers. MM, those pork chops do look good. I am going to try it this week. I can almost taste those pork chops and that salad looks so fresh and crisp,YUM! Fresh organo has a different zing from dried. I strongly recommend that folks use that. It’s very easy to grow. My mom’s marinada of the month is orgenano, lemon and whatever herbs i planted in pots. BTW I am a promdi from the city of malabon, just outside Manila. i was an FOB when i first moved here in Boston in the 80’s, OBTW, FOB is fresh off the boat. 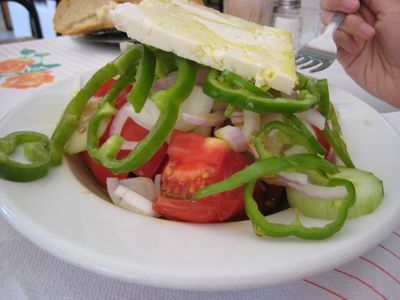 I apologize to all the promdis and FOBs that i might have slighted when i wrote about feeling like a promdi when ordering at that Athens restaurant. perdoname MM, but I have some info about FOBS: its supposed to be humorous! – You go to “mixers” on Thursday nights to meet other Yaps and talk about the Dow Jones. – If you drive a Civic, your dream car is a Supra. If you drive a Supra, your dream car is a Skyline (which you can never have). Poor Rice-boy. meaning you still carry your sense of fashion from your country which clashes with the current countries cultures. Local Hawaiians used it to refer to white people who came from mainland US to Hawaii. Its was used a lot by locals and surfers. it was to refer to white people who wasn’t up to date on the culture. It is now used a lot by Asians to refer to immigrant Asians of the same sense. Openonymous…THANK You for making my day with your commment above…I almost fell off my chair laughing which is NOT a GOOD THING for me anyway….just got back from physio and I am HILO to the max (as MS. DADD-F would say!!! )…Hmmmm…You are not SILLY LOLO, are you? Oh, just so you know, guys…I have lived outside my homeland most of my life. I practically grew up here …and yet, some of Openonymous’ or rather other people’s views up above applies to me!…I had a GOOD LAUGH AT MYSELF though!!!! Life is hard enough as it is (like my good friend Larry says) so it helps to laugh at oneself from time to time to keep one’s sanity!! !